A compliant person is readily willing to do that which is asked of him. If you have a contrary opinion or act in that fashion, you oppose or go against an existing opinion or fashion. If you demur, you delay in doing or mildly object to something because you don’t really want to do it. Something that is formative shapes or influences the growth of something else. An untoward situation is something that is unfavorable, unfortunate, inappropriate, or troublesome. Despite losing his allowance, his car, and his cell phone, Henry continued to defy his parents in recalcitrant or highly stubborn rebellion. He stayed out too late, told lies, and disobeyed their wishes in a continuing rush of recalcitrant and disobedient behavior. Henry’s mom took his recalcitrant or resistant ways with calm, knowing that high school was a hard time, and that her willful son was bound to struggle with authority figures. Quiz: Try again! When are people considered recalcitrant? When they continually rebel and are difficult to control. When they struggle against unfair and harsh rules. When they are in a rough stage of growing up. Calculus Trance Whenever I go to calculus the material is so hard that my brain falls into a trance, so now I'm recalcitrant to attend class. When one is acting in a recalcitrant fashion, one is in a “state of tracking back,” that is, one does not want to “track (or move) forward” by agreeing with what someone wants, but rather one “tracks back” and so symbolically refuses the requests of another. 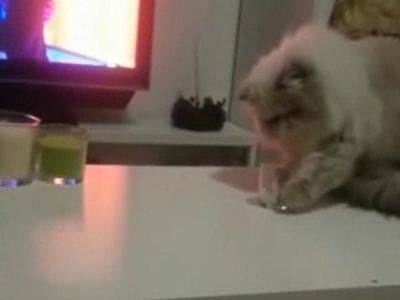 YouTube: Funny Cats Compilation This cat is being really recalcitrant.